Current economic conditions are affecting manufacturers of all types of medical equipment, including urodynamic measuring equipment. 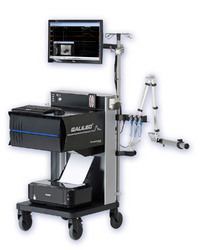 With the economy still on shaky ground and the fact that it is becoming more difficult to obtain bank loans Urologists, Gynecologists and urology clinics that have been considering purchasing new urodynamic equipment are considering other options including used or refurbished urodynamic equipment, or outsourcing to specialized urodynamic clinics. Urodynamics refers to a group of procedures performed to examine voiding (urinating) disorders. The goal of the diagnosis and treatment of these disorders is to both protect kidney function and to keep the patient comfortable. Any procedure designed to provide information and/or diagnosis about a bladder problem is called a urodynamic test. The specific type of test is dependent on the patients’ symptoms. Urodynamic studies are performed when the patient has one of the following symptoms: frequent urination, incontinence or difficulties in emptying the bladder. Urodynamic systems are used for the study of bladder and urethral functions using pressure and flow measurements. Urine flow testing is an essential part of urodynamic study, and flow meters are used for uroflowmetry, which is a test that measures the volume of urine released from the body, the speed with which it is released, and how long the release takes. Filling cystometry - This test measures bladder capacity, bladder contractions and urinary leakage. Voiding uroflometry - This test measures the strength of the urinary flow, as well as the amount of urine left in the bladder after voiding. Urethral pressure study - This test measures the pressure and flow of urine out of the bladder, using a sensor placed in the urethra. Video cystourethrography - This test helps to identify structural problems in the bladder or urethra. The bladder is filled with contrast fluid and X-rays are taken as the fluid is voided. Electromyogram – This urodynamics test helps measure muscle contractions that control urination. Urodynamic systems are usually designed to be portable and many are fitted with a cart and a computer monitoring system.